If your child is known as the “shy kid”, it can be really tough going for them. Having low self-confidence can make life all the more difficult – but taking martial arts can help. While you might think that engaging in martial arts only offers physical benefits, there are actually many ways in which this activity can improve mental health, as well. While learning physical skills and techniques, martial arts students are also being taught valuable lessons that can help them build their confidence over time. So, if your child is suffering from low self-confidence, martial arts has the potential to benefit them both immediately and in the long term. By enjoying a shared experience, your child will be able to connect with other kids around their age. Even though they spar with one another at times, kids in martial arts classes are learning and growing together in an environment where they are taught to support each other. It is a great opportunity to bond and make new friends, which certainly helps to build their self-confidence. Your child may not be tall enough to play basketball or they can’t run fast enough to play football – but those things don’t matter when they’re involved in martial arts. Whether your child is a little short for their age or they are little bit bigger than the other boys and girls, martial arts teaches them that their size doesn’t factor into their success. It’s all about their determination and hard work, as they work to master techniques. Their focus and drive play a bigger role in their achievements than anything having to do with their physical size. As such, there’s no reason that you need to be a certain height or weight in order to have fun and thrive while learning martial arts. So, if your child feels somewhat self-conscious about their size, taking a martial arts class can help to do away with those concerns. They’ll be able to learn new skills, make friends and achieve personal goals – without their size ever coming into the equation. When a child is self-conscious, any stressful situation can knock their confidence. In martial arts classes, kids are taught to thrive under stress using calm and focus. They are taught to turn their negative emotions into positive progress, a coping mechanism that allows young people to feel more confident overall. So, in the future, when they encounter something stressful, they can use the same techniques that helped them succeed in martials to cope with a situation that has the potential to make them feel less confident. Sadly, it’s not uncommon for young people to feel the need to be “perfect”. Even from a young age, kids today can feel pressured to look a certain way or achieve certain goals – and become frustrated and impatient if they don’t. As a result, their confidence can suffer. When learning martial arts, perfection isn’t the goal; progress is. After all, no one becomes a martials arts master in a day. Taking part in these lessons teaches young people that as long as they’re making progress, there is something about themselves that they can be happy with. By learning this lesson through martial arts classes, your children will feel less pressured to achieve perfection in the outside world and be able to be satisfied with the fact that they are making progress. When you’re going through a tough time emotionally, many doctors recommend engaging in physical activity to boost your mood. This is because exercise stimulates brain chemicals that play an important role in regulating your mood. Endorphins are released, as well as serotonin and dopamine – all chemicals that make you feel better. The same applies to young people. Research has shown that exercise improves mood and behaviour in children. Additionally, exercise changes where the brain directs its resources. When kids take part in martial arts and other physical activities, the brain’s resources are directed to areas that are involved in focus and coordination, rather than areas that are involved in anxiety and worrying. Martial arts have the ability to help kids work off the negative energy that they’re feeling. If they feel self-conscious about anything in their lives, taking part in martial arts classes for kids can help direct their thinking in a more positive direction. What is the Best Age to Start Martial Arts? If your child is suffering from self-confidence issues or you want them to start building their confidence from a young age, it is possible to get them involved in martial arts early on. There are many dojos that accept children. 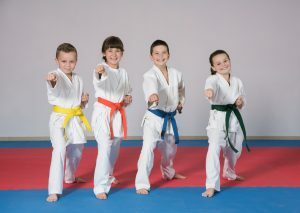 Experts suggest that you can enrol you child in a martial arts classes for kids from the age of 7 or 8. Of course, it does depend on the child and it’s always important to take a sample class find out if they are ready. After the lesson, the instructor will be able to let you know whether now is the right time for your child to start out in martial arts. When it comes to studying martial arts, the physical benefits are the most obvious ones – but, while your child trains, they’re also becoming more confident, happier and better able to cope with stressful situations. So, it is worth trying out a sample class to find out if taking martial arts is the best way to help build your child’s confidence.